"Hi auntie, Can I get any vegetable? You may give me anytime. "I asked my neighbor who is a farmer that sells fresh veggie at our company's quarters. "Sorry we don't have veggie currently. All die due to hot weather and insufficient water" the auntie told me. "Oh ya... The weather is too hot indeed. There's no raining for a very long time. Then it's ok auntie, TQVM" I answer. Whoa...... In all my life, this month is definitely the hottest weather ever that I can remember. Even if to compare during foot marching under the hot sun in the middle of concrete field of Padang Kawad while I was in SUKSIS. If not for the whatapp info I really didn't know it is actually equinox phenomena where plane of Earth's equator passes through the center of the Sun. Summed up with little rain for the past few months, and no rain at all the last 3 weeks no wonder the hottest is unusually hot. Luckily our place surrounded by oil palm plantation making the night not so hot and the road shaded by the palm tree, plus it is quite windy at our place. Usually I will not turn on the ceiling fan at the living room as I think it wasting electric even I didn't have to pay the bill (it is free for staff). But this time I opt to on the fan and let the hot air flow away, eventhough I'm in bedroom. The water in a bowl that I put in office to moisturize the room also dry up just in 2 days (during weekend where I let the window open purposely), instead of a week normally. The pile of water in bathroom still hot when I want to use it in the evening, even though it is not expose to sunlight. Mum said a farmer sell his duck cheaply for only RM10/ 1.5 kg duck. Which I think might because of the hot weather that he might not afford to take care of them. Some said cow industry also affected. I am lucky to live in company's quarters where we have enough facilities to store water for daily consumption. Compare to the surrounding village where the water is insufficient for daily use such as washing and bathing. Many gives up on gardening as insufficient water is not only the issue, the small veggie won't survive after the blazing sun. Even big trees such as banana tree and oil palm wilt with yellow leaves. I also not allow my cats to sit on my lap (Usually I am the one who really want their companion) as it feel so suffocate in this hot weather and they them self also generate heat. After lunch during my walk to office from house, I pass a construction site that makes new school. I wonder if they still working under the hot sun or do they working indoor such as painting the building or etc. I take glimpse along the way but cannot guess since they must still in rest time after lunch. It's really hot, but luckily the it's windy to countervail the hot weather. I pity those labors (including my mum) and I hope their preserves and hard work earn barakah for every penny of their salary. Even though I just walk for 4 minutes using big/ shaded umbrella, the hot weather is felt stingy. May this hot weather end sooner and back to normal. May we learn and repent of what happen from it. Save energy, water and sources. When they are insufficient we feel waste to use every drop. Plants/forest are important and the lesser the plant the hotter the village/town. A good weather is a blessing and rezeki, never can be count the blessing from Allah indeed. I always wonder how it rough in the dessert where there are not much plant, pond or river. 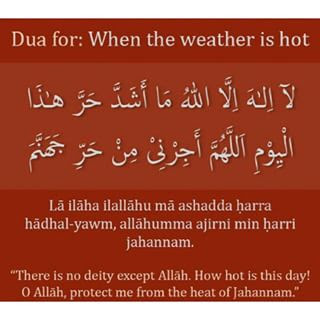 Ask dua for better weather.